One of the first things a new pupil is taught by Nottingham driving instructors is how to set the driving position for optimum comfort and safety. This is something perhaps forgotten after the test as you can see so many experienced drivers who do not pay attention to their seating position. They will often strain themselves to reach the pedals or sit too close to the wheel. 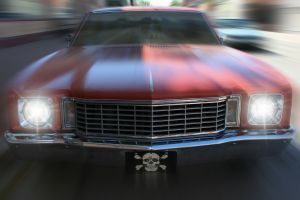 Let’s have a look at a few things to consider before you turn on the engine and move off. First thing to look at is the clothes you are wearing. So many pupils get into the car and keep their coat on. Yes, it may be cold outside but the car is heated and soon you will be too warm. Many times we have pulled over to allow the learner to take off coats and jumpers. If you were on a motorway you may have to sit there boiling before you got the chance, so make yourself comfortable before you start. I think some nervous drivers feel more protected if they keep a large coat on. It may protect you in a crash, but not much. Footwear is the other big thing. In a learner it can make a huge difference when it comes to clutch control. You don’t want the soles too thick or you can’t feel the pedal movement. Too thin and you may have trouble pushing the pedals down. Make sure they are not too loose or tight and that they aren’t flip flops. These have got to be the worst shoes for driving. Next comes the seating position. Car seats have a pretty wide range of movement nowadays to accommodate the tallest to the shortest people. It’s important that you adjust things correctly as poor posture can cause aches and pains particularly in the lower back and can effect your level of awareness on long journeys, putting you at risk while driving. You need to be a distance from the pedals which allows you to fully press down the clutch pedal without reaching too far or locking your knee. If you have to reach then chances are you won’t press the clutch all the way down and will grind the gears. If your knees are locked and you have even a moderate collision you stand a bigger chance of breaking your leg. If your leg is bent it will just fold in a crash. If you are driving an automatic check you can press the brake or accelerator without reaching. 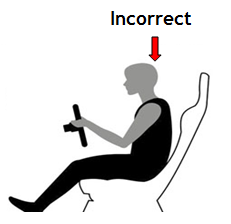 Sitting too far forward can hinder movement and trap your legs under the wheel. Shorter people will benefit from raising the height of the seat. This will give you a better view of the road ahead and also the dials on the dashboard. As the seat tilts forward as it is raised it allows for better reach of the pedals. The seatbelt anchorage point can also be lowered so the seatbelt fits correctly over the shoulder and across the chest. With the seat too low the seat belt can cut into your neck. Nottingham driving instructors do it while sitting comfortably! Alter the rake of the seat, that means the degree of backward tilt, so it supports your weight and doesn’t have you leaning too far back or hunched over the wheel. New learners tend to have the seat tilted too far back and then pull themselves forward using the wheel. This causes wobbly steering and is sometimes a sign of nerves. Remember the head restraint is just that and not a head rest. One pupil I had recently could not help but force his head back against the head restraint by pushing against the wheel with his arms. Not a good posture at all. You can’t move your head properly to look to the side. A guy I gave instructor training to was involved in a car accident. He was hit from behind by a car moving at speed. He had checked his mirror and saw that he was going to be hit. The mistake he made was to brace himself by locking his arms and gripping the wheel tightly. He suffered serious damage to his wrists on impact. This is one good reason not to lock your arms when driving. 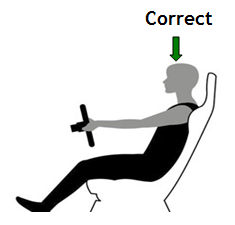 When the arms are extended then the inside of your wrists should touch the wheel. They will then have a bend in them when the wheel is gripped properly allowing for more accurate steering. In the event of a crash the arms will bend and the seatbelt will prevent you from being propelled forward. Once the seat has been set you may need to adjust the steering wheel to finish things off. If you’ve got long legs like me then you may have the seat quite far back and low down. 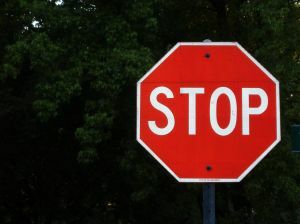 To prevent reaching for the wheel, flip the lever and pull the wheel out towards you. It can also be raised or lowered. Don’t have the steering wheel too close to your chest. There can be the risk of injury if the air bag goes off. You need a distance of at least 12 inches between you and the steering wheel for the air bag to do it’s job. When you have the position you want just flip the lever back and make sure it locks back into place. There you have it. Take a bit of time before your next drive to make sure you are as comfortable as possible. Happy motoring to you. Don’t drive over our furry friends. 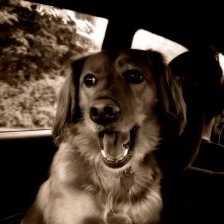 Not many people think about road accidents involving animals. Most of these accidents happen on quiet rural roads so are perhaps not seen by so many people on driving lessons. If you are mainly a city type person there are dangers you need to watch out for on country roads where animals are free to roam around. Sheep and deer are the most common animals to be involved in accidents. It’s not hitting the animal that causes the accident most of the time. It’s when a driver swerves to avoid the animal that crashes occur. The deer may just walk away unharmed. During lambing season you may see new signs put up to warn you of the presence of animals. People herding animals will do so mainly during the day as it would be way too dangerous at night. The vast majority of people will drive mainly in the towns and cities. Accidents involving animals will therefore seem obscure and not really worth thinking about. Motorways can sometimes have accidents involving animals as they run next to fields where animals escape and go walkabout. Horses have been seen running on the motorway bringing traffic to a halt on rare occasions. Accidents that involve animals in the city environment are usually caused by pets not kept properly under control. This can be a problem for older drivers. If you see someone walking a dog on the pavement which isn’t secured on a lead then slow down and be prepared in case it runs into the road. I can tell you it’s a horrible feeling when you run over someone’s cat as it runs out straight from under a parked car and leaves you no time to stop. Looking ahead in between parked cars and underneath cars in the distance will give you time to take action and avoid a last second swerve. 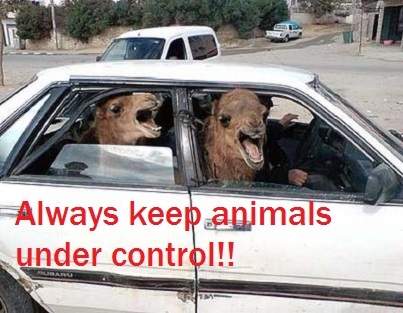 Look out for animals on driving lessons. The urban fox is becoming increasingly common and there are no shortage of dead foxes that have been hit by cars along the dual carriageway. As vehicle speeds are higher on these roads swerving could be lethal so looking along the verge for any movement is important. I drove on a narrow country lane near some horse stables during an advanced test which was a bit of an eye opener. I brought the car to a halt as a young rider lost control of her horse. If I had not stopped in good time the consequences could have been serious. Look through the gaps in trees and bushes on bends to get the early view. Danger from animals can also come from inside the car so make sure your pets are kept properly restrained and not allowed loose in the car. A dog sticking it’s head out of the window from the front passenger seat may look cute but is probably not such a good idea. Stones and other road debris can be thrown up by the wheels of other vehicles and hit the dog causing it to panic. As well as being distracting there can be real danger such as a cat I carried many years ago crawling under my feet around the brake pedal. I should have kept it restrained in a proper carry box, and you should carry your pets properly too. Check those door mirrors before you move. It’s been a week where a lot of people have been getting ready to take the driving test. As we prepare for the big day with some busy town drives it has brought to light how neglected the faithful door mirrors can be by learners and the more seasoned driver. It’s important to link the use of door mirrors with space. Not space as in the final frontier but the road space you are about to drive into. Space comes in different varieties. Safe space is a part of the traffic flow that is OK to move into. In order to know that the space is safe down the side of the car you drive when changing lanes you need to look in the door mirror as well as the internal rear view mirror. Make sure the mirror you check is at the side you are about to move into. Not much point checking the left mirror when changing lanes to the right. Not much point checking the left blind spot before moving off from a normal position. Contested or closing space is where another vehicle wants to move into the bit of road you intend to use. If you see a car closing in you may need to check the mirrors over a longer period of time to see the movement of the other vehicle and anticipate what’s going to happen. Don’t make it one long look. That would effect steering which is not good. Use a few short glances and keep returning your attention to the road ahead. 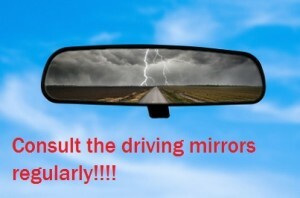 Check the blind spot like your driving instructor taught you. When you want to move left or right around parked cars check the door mirrors first. 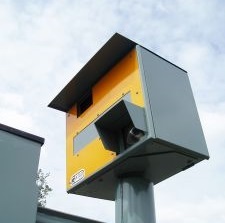 They are not to be used only before signalling though this is important. Changing lanes may also require a tiny glance into the blind spot over the right shoulder, often neglected by the learner driver. Don’t look for too long. My car nearly ploughed into a wall once from a learner turning their head and staring behind. If you are moving off in lanes of traffic check both door mirrors for any cyclists or motorbikes filtering through. Some people will often pull a hasty three point turn to escape the traffic jam. A biker buddy of mine went flying over the bonnet Superman style and ended up with a neck brace and three weeks off work because of this. A mirror check before moving would have prevented this. Regard the door mirrors as your friends. They are there to help you make the right decision. Don’t ignore them but keep them clean and nicely adjusted. They will help look after you and those around you. Park safely when you’re popping to the shop. 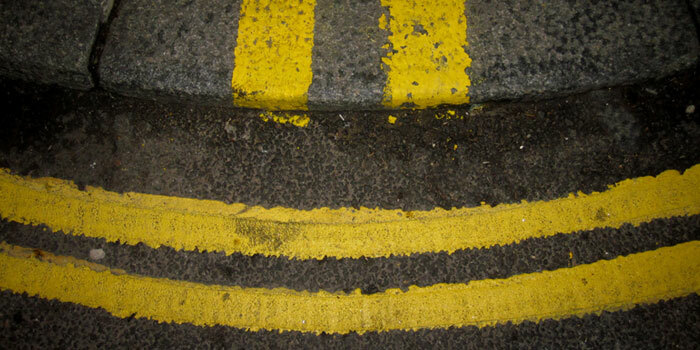 Plans are being made to allow short term parking on double yellow lines. You can drop off and pick up passengers on these lines but not actually stop and wait. Local shops on the high street suffer when drivers cannot stop to shop. People don’t seem to want to park somewhere else and then walk back to the shop. Time is money and with the daily demands of life people just haven’t got the time. It’s got to be out of the car and into the shop. Sometimes it would be handy to be able to leave your car for a couple of minutes to go to the shop but the risk of a parking fine puts people off. It’s easier to shop online or go to the major supermarkets where you can park safely. Local economies would receive a big boost if drivers were allowed to park for a short time. just long enough to get what they need and go. People don’t really browse in small shops so these things rarely take long. 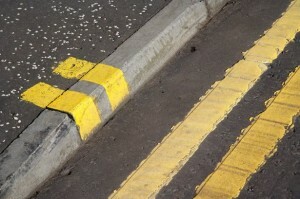 Many double yellow lines no longer need to be there and room could be made for short stay parking bays. Care needs to be taken on where these lines are removed from. They are placed on the road for safety reasons where there is not enough room to stop and sight lines are very short due to bends and surrounding buildings. Look before you open the car door. Pulling up in a busy area with pedestrians and shops has it’s own dangers. Take care where you leave your vehicle and make sure others can pass before you switch the engine off. Make sure you are parked straight and close to the kerb. Look out for pedestrians, especially children as you pull in. It’s common to see people walking out of shops and onto the road while texting or talking on a mobile phone and not really looking at what’s going on. Take it slow and sound the horn if necessary. Mind how you open the door. 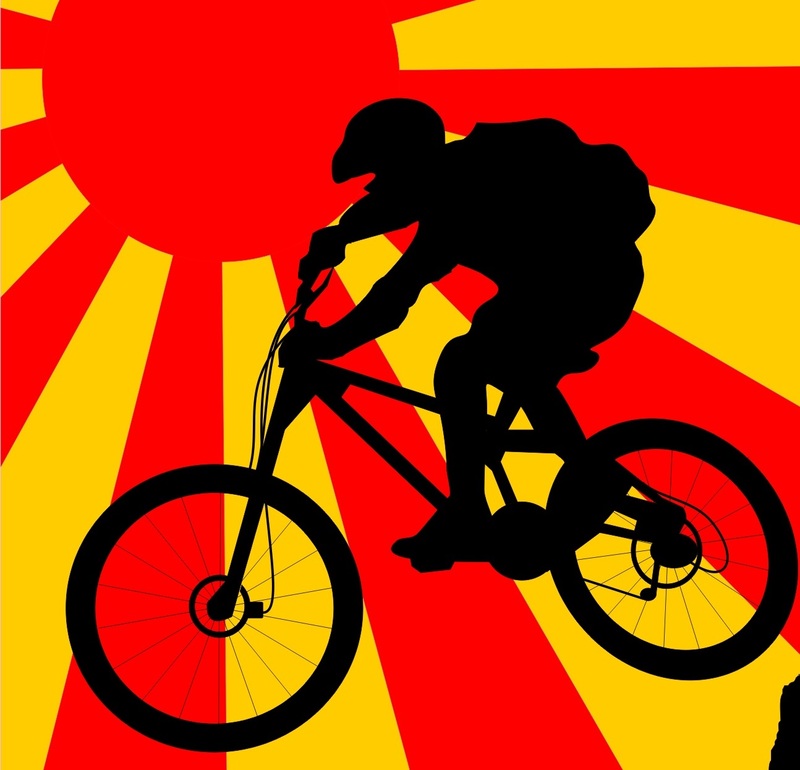 Check the mirror before getting out and pay particular attention to approaching cyclists. Motorbikes can be hard to see and opening a car door in front of them can be fatal. It may be better to slide across the seats and get out of the passenger side. If you park in a marked bay make sure you are fully inside it. Nothing gets people annoyed more than a car straddling two bays. Allowing parking near local shops is a good thing. It might bring the high street back but there are definite safety issues to consider. Use your common sense and keep your eyes open and it’ll all go smoothly. Cyclists and drivers should love each other more. With more and more cycles competing for road space with cars and other vehicles it is no surprise that people on both sides can get annoyed. I had a pupil taking driving lessons in Nottingham with me who hated cars when she was cycling and hated cycles when she was driving. Not a healthy attitude at all. The way new drivers approach cyclists on the road during lessons falls into two categories. Some pupils actually moan when faced with the prospect of overtaking a bike. They become tense at the wheel and seem aggressive as if they actually resent the cyclist being there. The driving task does become more complicated when you have to overtake a cyclist but this is no reason to get annoyed. The new driver will tend to go way too close to the cyclist instead of hanging back. 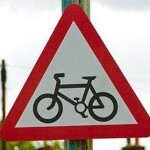 Bikes can stop much quicker than cars so leave enough stopping distance. Driving straight round a cyclist no matter how little room there is can also be a problem. You need to pick your spot to go around. 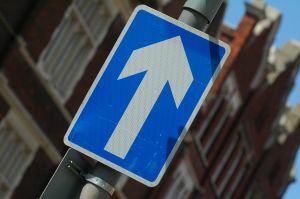 Make sure you can move to the right enough and get back to your own side in time to avoid oncoming traffic. You need to time it right so you don’t pass opposite a central reservation. There’s simply not enough room. Some learners can be too cautious which leads to other complications. Look out for cyclists when learning to drive. Don’t hang behind a cyclist forever. Cars will queue behind and have to overtake both you and the bike. Go round first chance you get which can be difficult on country roads. When you pull out leave enough room so the cyclist can swerve if necessary. You don’t need to shift all the way to the other side of the road. Cyclists can make it easier on themselves and drivers. Don’t weave from the pavement to the road and back again. Red lights mean stop even if you are on a bike, a lot of people seem to forget that one. Look for indicators before passing cars on the left. There’s lots you can do to help the overall traffic situation. If we all take a more co-operative attitude we can reduce stress levels and make the roads a nicer place to be.